"We all need that special someone in our lives." 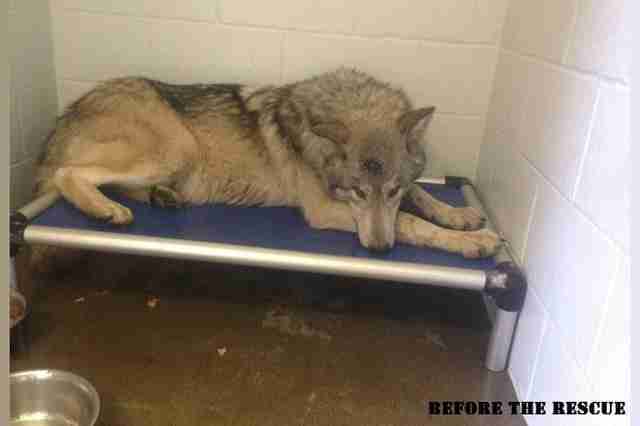 When an animal control officer first caught Cinder, they thought he was a wolf. 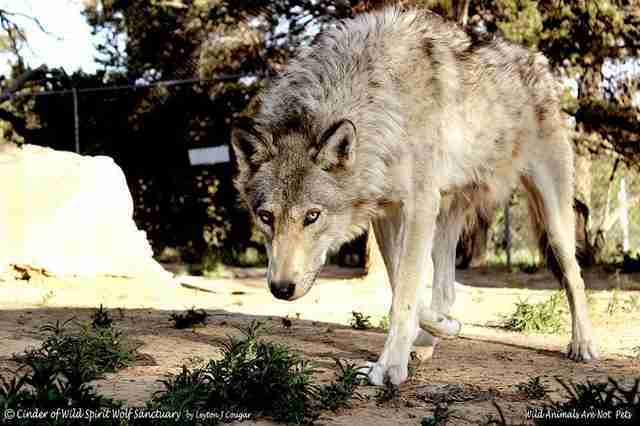 He certainly looked like a wolf with his long, lanky body, coarse fur, rounded ears and amber eyes. 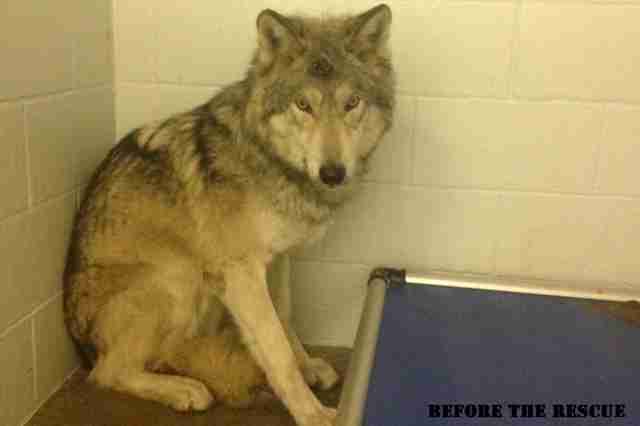 Cinder had been roaming around a neighborhood near Flagstaff, Arizona, for weeks. He'd often approach yards with dogs and play with them through the fence. Cinder was quite skinny, and one family started leaving food out for him. However, no one was able to approach Cinder, let alone touch him. Eventually someone called animal control, and officials set up a trap. Once Cinder was caught, officials took him to the shelter run by the Coconino Humane Association. Since Cinder looked so wolf-like, the Arizona Fish and Game Department got involved. 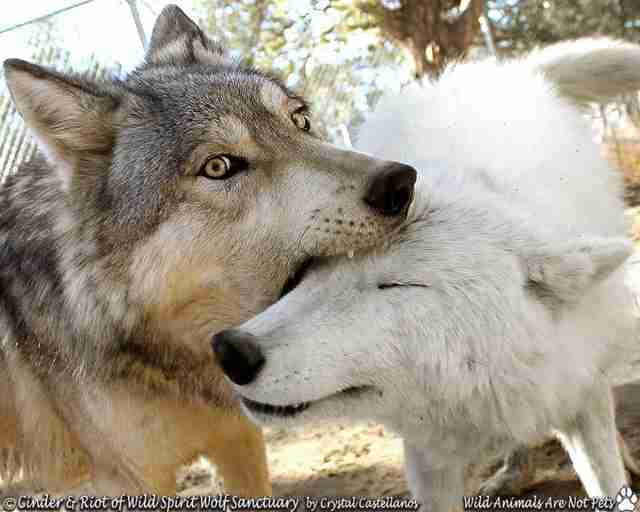 If Cinder was indeed a wolf, they'd be responsible for reintroducing him back into the wild. However, a DNA sample revealed that Cinder was actually a wolf dog hybrid, which meant he was no longer the responsibility of the state. 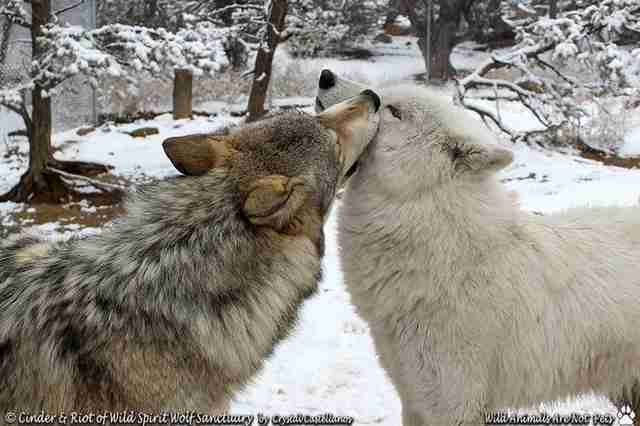 While it is illegal to keep wolf dogs as pets in many states, people can technically keep them as pets in Arizona. Still, the shelter knew it would be difficult - if not impossible - to rehome Cinder since he was so afraid of people. Not only that, but the shelter would only hold onto Cinder for a limited amount of time. 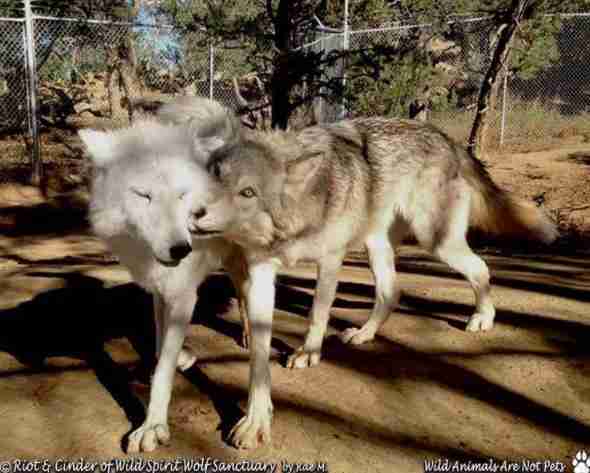 Shortly after the Arizona Fish and Game Department took the DNA sample, Cinder managed to escape the shelter, which is something wolf dogs are good at doing. "There's speculation that the gates or doors weren't closed properly, giving him the opportunity to find his way out," Crystal Castellanos, assistant director of Wild Spirit Wolf Sanctuary, told The Dodo. "These animals are highly intelligent. If given the slightest chance, they can find their way out of most situations that they deem scary." The shelter staff managed to recapture Cinder, but they knew they needed to find a better solution - and quickly. 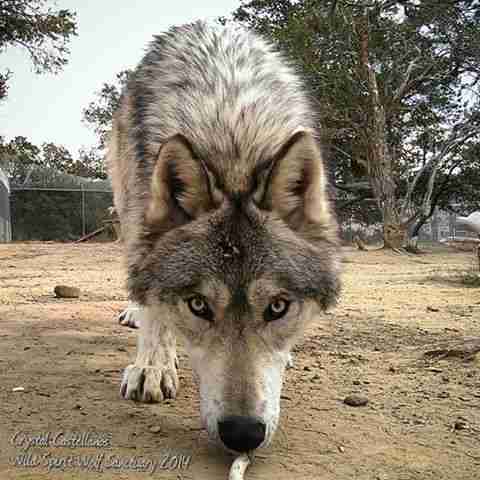 They contacted Wild Spirit Wolf Sanctuary, a New Mexico refuge for wolves and wolf dogs, and asked if they would take Cinder. Thankfully, the sanctuary said they would take him, and two volunteers made the four-hour journey to get Cinder. For the first seven months at the sanctuary, Cinder was kept in an enclosure by himself while the sanctuary staff tried to figure out who'd be a good companion for him. They had one animal in mind - an older female wolf dog named Riot. Riot had previously belonged to a Californian woman who bought Riot with the intention of breeding her. 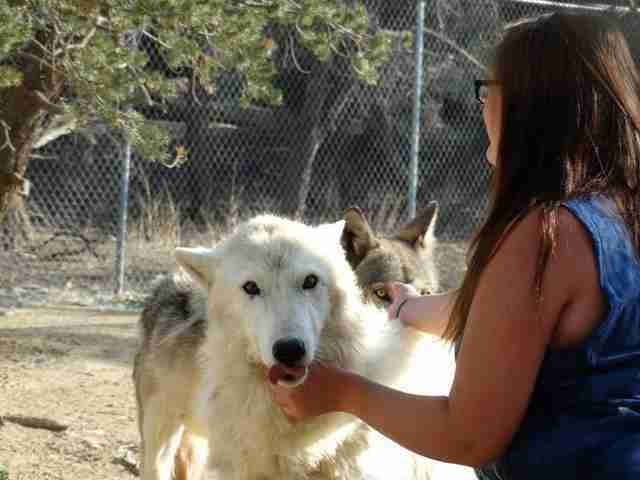 But when Riot grew to be bigger than she expected, the woman realized she didn't have the space to keep Riot, and surrendered her to Wild Spirit Wolf Sanctuary. 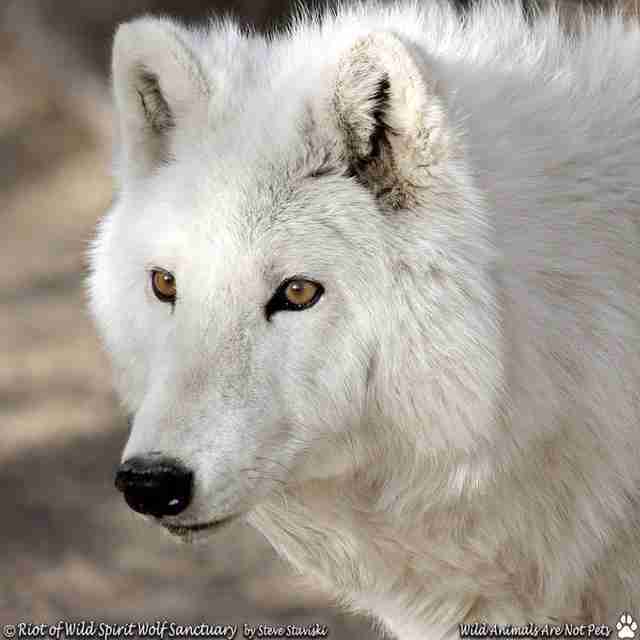 Riot was initially placed in an enclosure with an arctic wolf named Doc. 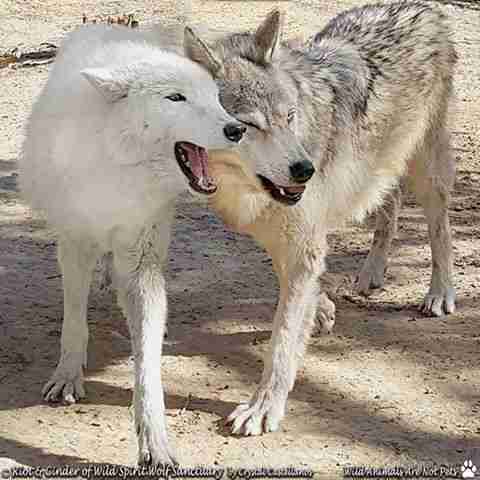 While Riot and Doc were a good match, he was eventually moved in with another arctic wolf. Besides, everyone had an "intuitive" feeling that Cinder and Riot would be a good match, according to Castellanos. On the day of Cinder and Riot's introduction, everyone held their breath. "We walked Riot to [Cinder's] habitat and watched the body language from both," Castellanos said. 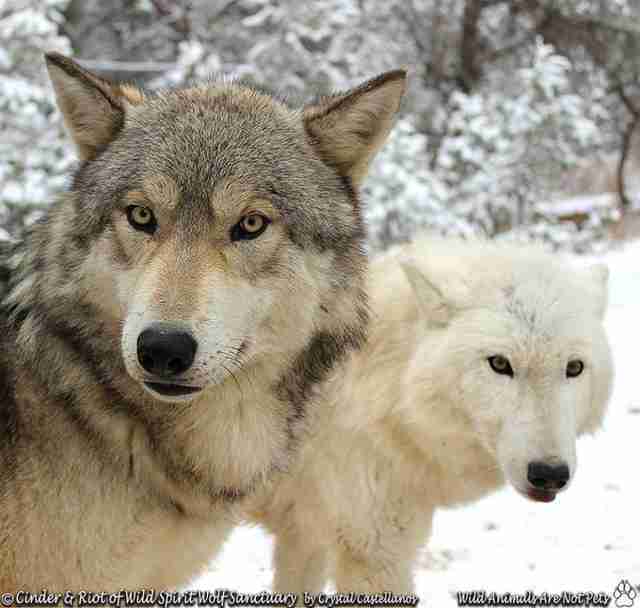 "All looked well and we immediately opened the gate for her to run into his habitat and it was great. Tails wagged in delight, he was interested in her, she in him and they had a great nose-to-nose greeting. I'd say they understood our intentions and agreed they were fit for each other." Soon Cinder and Riot were inseparable. In fact, the sanctuary staff started calling them boyfriend and girlfriend. Cinder and Riot love doing everything together - roughhousing, "fence fighting" with their neighbors and playing with stuffed animals. They also enjoy the odd leashed walk, although Cinder remains nervous around people. But what Cinder and Riot seem to enjoy most of all is each other's company. "We want our animals to be happy, and one of the best ways to ensure that can happen is by finding them compatible partners," Castellanos said. "We all need that special someone in our lives." 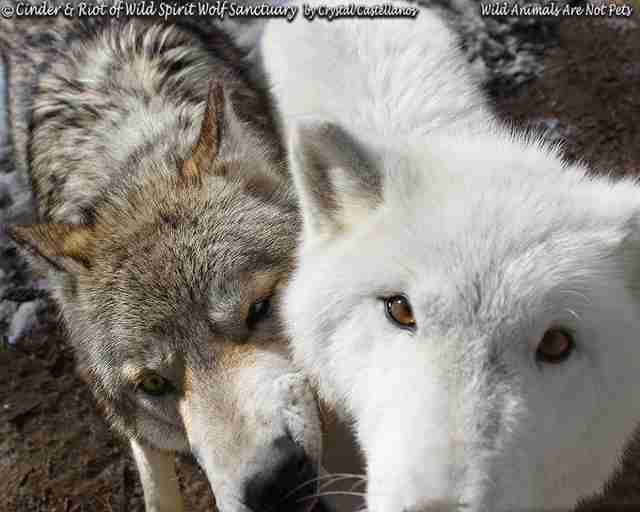 To help wolf dogs like Cinder and Riot, you can make a donation to Wild Spirit Wolf Sanctuary here.